DatePicker in Countdown mode - days option? Just wanted to ask if anyone knows if there is a feature/attr etc somewhere in the datepicker in countdown mode to show days, hours, minutes instead of just hours and minutes. I am guessing there is not, I just wanted to ask just in case I missed it. I did some investigation inside Pythonista but could not find anything. Below is a silly example to illustrate it more clearly. In the example rather than using the datepicker as an input control, I am using it as a display. Look its not super critical, but the datepicker could be more useful with finer resolution I think. @Phuket2, looks like that’s what you get from Apple. 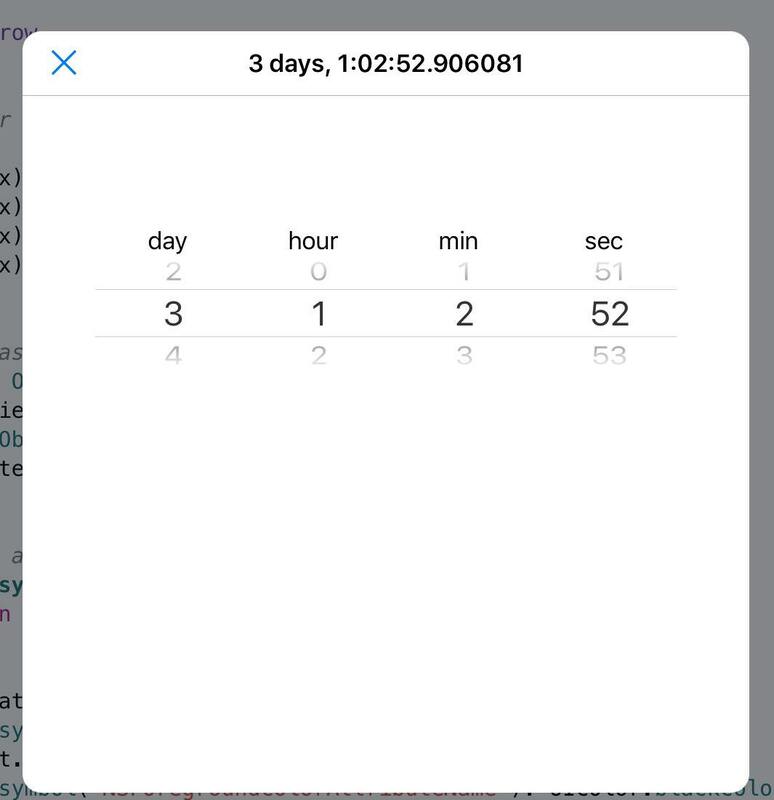 How about using a SceneView and modifying the experimental stopwatch from examples? Thanks guys. I was just suprised it didn't support what I was trying to do. I wanted this sort of timer for my game I play for some time, and I always end up avoid doing it. But yesterday I thought I will just make a simple version of what I want and just get it working. I have to say with the advent of the update method, using TinyDB and arrow that the nuts and bolts of what I wanted to do was easy. Have to say @JonB the PYUIFile Loader also added to the simplicity of putting this together all pretty quickly. But I was suprised how it all come to a screeching halt when I wanted a UI to input my timers value. That's why I asked if this was apples implementation. Just seemed strange to me that Apple's control wouldn't have supported more. Well minimum DD:HH:MM and possibly seconds. Oh when I said it come to a screeching halt, I basically mean my rhythm was gone. All the other nuts and bolts went fast and smooth. I wont use @zrzka control, I will do something with textfields I think for the entry and use like a progress bar/with caption to show the countdown. Later I might look at the stopwatch example again. Also, I might look at the analog clock example again. I cant remember who, but after one of my posts a guy rewrote the analog clock to work as a ui control rather than scene. Anyway, I will take a look. I was also a little suprised at how the notification module was working. @omz mentioned that the module needs attention, so thats nice. Anyway, I am not bitching. Just sharing an experience in a way. I rarely write anything other than a few small tools(very smallI) actually want to use. This was not big, but I will use it. The real implementation will be using a TableView as the game I play has multiple timers running continuously and are important for the game. Some timers should automatically reset after say every 3hrs, some timers need to be reset manually approx every five days. Then need to convert some of these times to show the local time they expire etc. The good news for me is that with the tools/libs I have this will be fairly straight fwd. The bad news for me is I let small things like the datepicker slow me down and lose my rhythm. BTW, I am sorry I dont go looking the the apple docs myself. That would be even a further distraction, also I dont have the confidence to know whether I am going to come away with the correct answer. In case I really just wanted to know 100% from someone who understands the Obj c documentation. @cvp , hey, thanks for going to the trouble to do this (also thanks @zrzka ). Its not important, but it wont load in the Today Widget. As I say, not important. Just as I am playing with thee TDW I thought I would give it a quick go. I didn't get things lining up correctly yet as I had to move it up a little. But it works in Pythonista, so I guess its just a memory issue. I see it flash up loading BlackMamba when its in the Today Widget, then the message comes up 'Unable to Load'. I clicked that a few times. Again, this is just a FYI. I will tidy up my class you edited, so you can pass the time info etc to it and maybe so other useful methods/properties and repost. @cvp, was just playing around with the datepicker. But it occurred to me that if apple had included a number/float mode you could use multiple datetime controls to create a input view with many possibilities for data entry. Maybe it would require max and min properties, but it would be super flexible. Again, not important, just an observation. @cvp , but I am i right in saying in Pythonista we dont get that implementation? I am not trying to be smart, just trying to understand it.